The menu Project - New µVision Project creates a new project. Select an empty folder and enter the project name, for example Project1. The file extension is *.UVPROJ for MDK version 4, or *.UVPROJX for later versions. It is good practice to use a separate folder for each project. Next, the dialog Select Device for Target opens. Select the device database. Default is Software Packs. You can have various local device databases, which show up in the drop-down box. Select the device for your application. 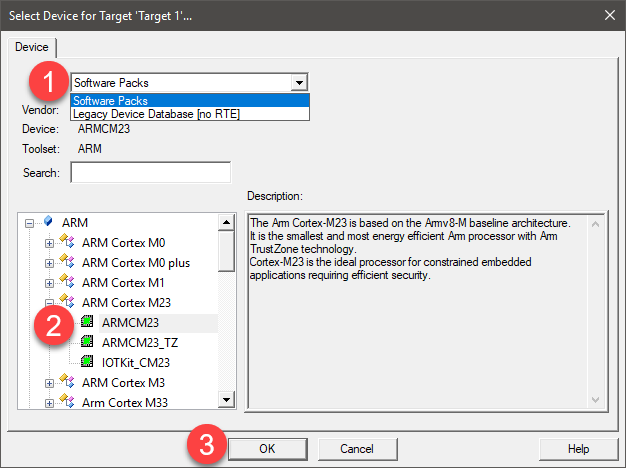 This selection defines essential tool settings such as compiler controls, the memory layout for the linker, and the Flash programming algorithms. Some descriptions might contain instructions for configuring the device. Read the information carefully and Customize or Add Devices. Continue with Use Software Components. Select Device describes the dialog fields. Configure Startup Code to match the configuration of the hardware design.